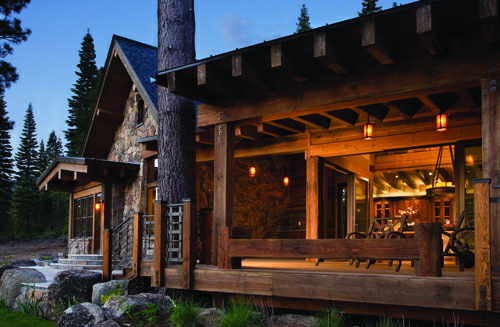 Contractor Jim Morrison, who built the first home in Martis Camp (shown here), uses large sliding glass doors to connect the inside with the outdoors. “Martis Camp is a playground for design,” says interior designer Catherine Macfee, who owns Tahoe City’s Rubicon Collection. Indeed, accounting for the bulk of the regiona’s new constructin, the planned community, with its accomodating design requirements, is turning into a showcase for the area’s builders, designers and craftsmen to highlight the latest trends and most unique expressinas of their given industries. “We’re inventing new techniques out there, distressing woods and combining colors,” says Bill Kelly of Kelly Brothers Painting in Truckee. Kelly, who has completed a dozen houses plus the green stain of the Camp Lodge and the vivid custom red of the Family Barn, says that most homes are gravitating toward warm, inviting hues. “The colors are really generated from the environment,” he says. “There’s a lot of natural and earth tones, as well as greens and blues.” And, though all of the homes are new construction, he notes that many still desire that “old home” feel. “We’re taking essentially raw lumber and antiquing it to look like 100-year-old wood,” Kelly says. He adds that many clients are also requesting decorative finishes, such as glazing or using multiple coats of paint. “We’ll use three, four, five different colors and layer them over top of each other to create this look that gives a lot of depth and uniqueness.” Due to demand, Kelly Brothers uses only certified green products and techniques. Kevin Hanna, president of Greenwood Homes in Incline Village, has four custom homes under construction at Martis Camp: one with Steamboat Springs–based Kelly & Stone Architects and three with Arizona-based Swaback Partners. “Old Tahoe was the cliché,” he says. “Now, we’re embracing more of a modern mountain feel.” Some of the trends he’s seeing are the use of reclaimed woods (“it gives the home a more grounded, cabin-style look”) and the inclusion of outdoor living spaces, such as sitting areas and barbecues. Mark Osberg, of Estate Landscape & Irrigation in Kings Beach, has also noticed the desire for outside living. “This means spacious patios with fire pits, and sometimes a spa,” he says. His recommended material is interlocking pavers, due to their durability, ease of maintenance and choice of colors and styles. Another trend Osberg has noticed is that people want landscaping that is “very natural with simple beauty and style.” He’s seeing low-volume drip irrigation for plantings, and promotes wireless sprinkler controllers that are based on mini–onsite weather stations, drastically reducing water consumption. Outdoor living and modern conveniences aren’t the only factor influencing home design. “Lake Tahoe is a unique area,” says Brian Spanier of Hunter Metal Forge & Iron Works in Kings Beach. “Because of fault lines and the snow loads of high elevations, most every house has structural steel, whether it’s hidden or part of an architectural element.” Spanier, who did the steelwork for three of the 2011 TQ Mountain Home Award winners, notes that one trend he’s seeing is to leave the metal exposed. “One of the reasons I like exposed steel is because it’s a natural product,” he says. “It’s 80 percent recycled and 100 percent recyclable. In its natural state, it has a lot of colors that match other materials.” Spanier says that his company also creates hand-forged ornamental work, from railings and doors to lighting and fixtures. He asserts that, while steel contributes to a “mountain contemporary” look, the metal will always look good. “I believe it’s timeless,” he says. Woodworker Fred Quinterno of Quinterno’s Furniture in Nevada City is familiar with this desire to create heirloom treasures. Beyond designing custom cabinetry and furnishings, he’s noticing a trend toward pivoting entry door systems. “They are unique because of their design and functionality,” he says. “They are large, heavy doors that pivot in or out with very little effort.” Indoors, he says, many rooms are separated by barn door–style sliders.